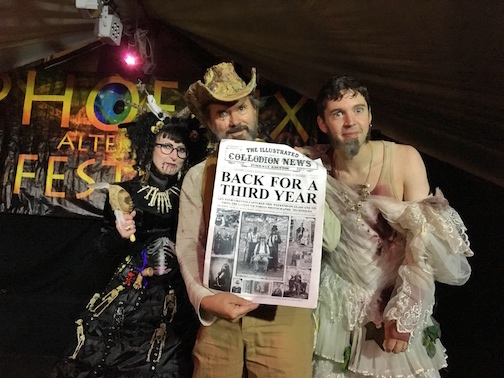 The Phoenix Alternative Festival asked us back for another year, this time our third, its always great fun even if the weather wasn’t going to play along this time. This year we were joined by fellow wet plater Laura Rhiannon Peters, along with Andrew Billington (Moo Pa to his friends), Patrick Ballanger and myself. 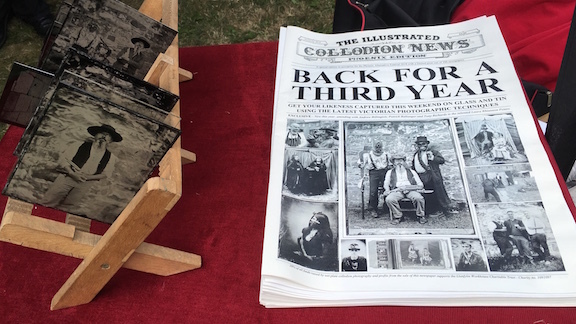 To mark this momentous occasion we produced our first run of The Illustrated Collodion News, a limited print run of 200 broadsheet newspapers. These were very well received and intended as part educational part promotionalpart a little bit of fun. There are only a few left, get in touch if you’d like to have a copy (£4). We had a similar set up as previous years in one of the busy courtyards, even with four wet platers working out of one gazebo it seemed to work very well. It was a little quieter this year but thats not surprising considering the weather forecast, although it wasn’t as bad as we had expected, it did put a little dampener on the proceedings. We still managed to shoot a whole load of plates and Patrick was very creative with his hand tinted coloured glass Jeweltypes. Amazing work Patrick and well done everyone for all the hard work which raises money for a very good cause. We’ve made some amazing friends over the past three years, its always a pleasure to see them and shoot some plates. The weather forced us indoors on occasion and we were grateful for a room being made available for finishing the plates and varnishing. And sometimes, just sometimes, things go wrong. Just before this plate I got distracted by Laura and the plate caught alight but I managed to blow it out before any damaged was done. I should have known better and taken a break or had some lunch but this next plate, that the couple were very happy with also caught alight during varnishing over a naked flame, this time a little more lively that one might expect. Worried about my hands I instinctually threw it to the floor and stamped the flames out… I looked up and I see Patrick staring at me in disbelief…. Yes, I just did that. Idiot. The plate now lay on the dusty floor covered in one very large boot print. I just stood there shaking my head in disbelief. Well theres always a first time for everything. For some reason I threw the plate in the bin in disgust with myself. On looking at this quick digi shot it could have been salvaged, cleaned and revarnished. If the couple in this plate are at Phoenix next year I will shoot their plate for free. Sorry. And heres another first, I’ve never felt the need to video a plate in the fixer but Moo Pa was on a roll and I thought I’d capture the moment for him. Obviously speeded up a tad. Looking forward to next year, we are planning something just a little different… if someone sees a small circus tent for sale please let me know. 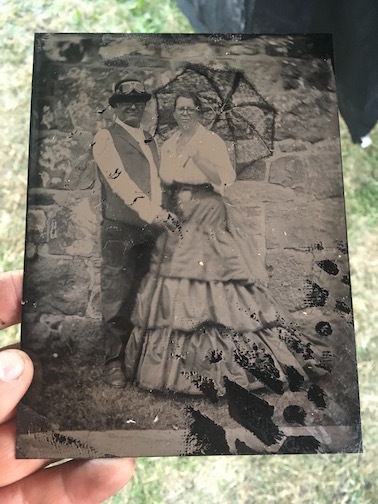 22 Aug This entry was written by Fourtoes, posted on August 22, 2018 at 4:37 PM, filed under Wet Plate..